O/o the Deputy Director of Economics & Statistics, Dibrugarh. 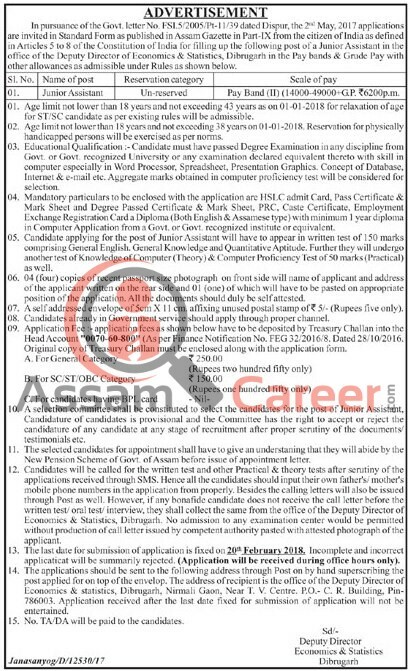 Applications are invited from the Candidates in the Standard Form of Application published in the Assam Gazetted filling up of following post of Junior Assistant, in the establishment of the Deputy Director of Economics & Statistics, Dibrugarh. Age: Must not be less than 18 years of age and more than 38 years of age and 43 years in case of SC/ST Candidates as on 1st January/2018. Education Qualification: Candidate must have passed Degree Examination in any discipline from Govt. or Govt recognised university with skill in computer especially in Word Processor, Spreadsheet, Presentation Grahics, Concept of Database, Internet & email, etc. Selection Process: Candidates have to appear in written test of 150 marks comprising of General English, General Knowledge and Quantitative Aptitude. Further they will undergo another test of Knowledge of Computer (Theory) and Computer Proficiency test of 50 marks (Practical) as well. How to apply: The applications should be sent to the following address through Post or by hand superscribing the post applied for on top of the envelope. The address of recipient is the office of the Deputy Director of Economics & Statistics, Dibrugarh, Nirmali Gaon, Near TV Centre, PO- C.R.Building, PIN-786003. The last date of submission of application is fixed on 20th February 2018.